﻿ WebDesign Tetris 1.0 - WebDesign Kft. 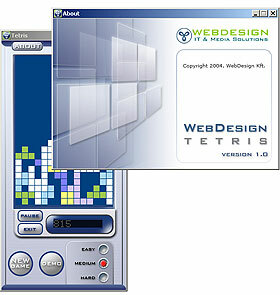 WebDesign Tetris 1.0 is a free tetris program for Microsoft Windows. This is an install version of WebDesign Tetris 1.0, after downloading please run the program to install the Tetris software. Have a nice time playing Tetris!